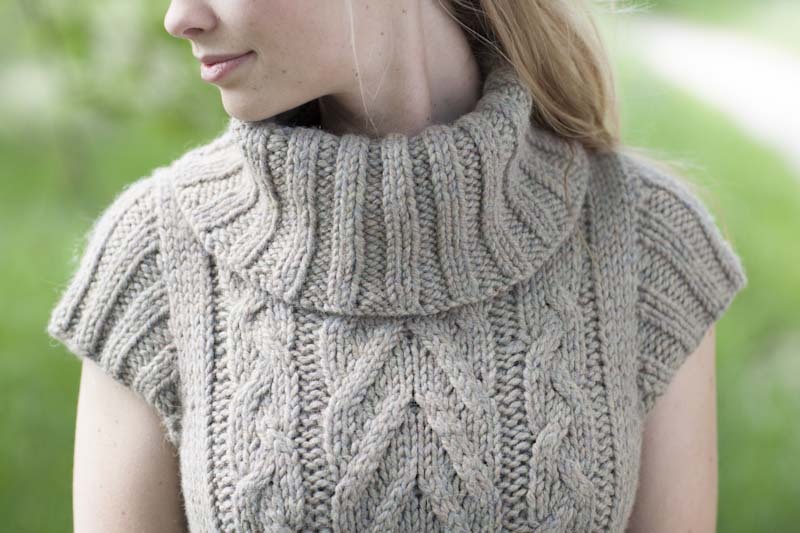 Smooth, drapey alpaca streamlines the look of a cabled tunic. A slim fit and kangaroo pocket keep chunky cables modern. Piece is knit flat and seamed. Finished Size 30½ (35½, 40½, 45¼, 50¼)" bust circumference. Tunic shown measures 30½", modeled with negative ease. Yarn Alpaca with a Twist Big Baby (100% baby alpaca; 82 yd [75 m]/3½ oz [100 g]): #0094 harvest, 10 (10, 11, 12, 13) skeins. Needles Body-sizes 10 (6 mm) and 10½ (6.5 mm): straight. Collar and sleeves-size 10 (6 mm): 16" circular (cir). Adjust needle size if necessary to obtain the correct gauge. Gauge 13 sts and 17 rows = 4" in St st on larger needles; 15 sts and 20 rows = 4" in k2, p2 rib on smaller needles; 34 sts of Cable chart = 8½ " wide.